Who you optimise your platform for is probably what’s ruining it. So do the reverse. Anya was right, it’s always the bunnies. You may have noticed a flourish of “premium” or specialist freelancer platforms lately. It’s an obvious problem to solve; everyone who’s looking to outsource creative or development work complains about how hard it is to find talent. The video call was about developing a niche specialist platform within a particular medium. As the wireframes came through and we discussed the business model and features, it became obvious that this platform was falling prey to a typical thought-trap that affects a lot of startups when it comes to product design: what to optimise the platform for in order to be profitable. The platform was falling prey to a typical thought-trap many startups suffer from. The typical thinking of people with investor money follows a sort of obvious logic, e.g. Your high tech startup should invest highly on recruiting the most talented engineers (necessary for building stuff), and not so much on HR, right? If you have a paid platform for recruitment, or freelance platform aimed at big companies wishing to outsource work, you optimise for the paying customer, right? If you have a national park around seeing the Iberian lynx, you make sure the environment optimised for the lynx. Not the dime-a-dozen wild bunnies, right? It’s obvious and logical, right? Bunnies are the basis of the the entire lynx ecosystem. No bunnies? No foxes who eat the bunnies, no lynxes (who eat foxes). Those highly motivated, super-talented employees need even more care and maybe even personal development than average employees. You absolutely need skilled HR or risk becoming the next Uber. without optimising to attract high quality talent, your customers have nothing worth paying for on your platform. You’ve created an expensive HR/Freelance equivalent of those dollar book clubs. People will try it out, and then they’ll move on. And the next platform will try and fix the problem. It’s the opposite of trickle-down economics. Especially since this model actually works. Optimise your platform around the bunnies, the building blocks upon which the whole ecosystem depends. Make it attractive and easy to those niche case designers, graphic artists and developers who bring that ‘magic extra’ perspective to a team, not just your mental image of what a ‘typical’ developer or ‘creative’ looks like. Make it attractive to people with ten+ years in industry who aren’t desperate for any job but are interested in sharing skills and belonging to a community or seeking a better quality of work/life balance. Make it inclusive to women and non binary people (that means at least having a documented process for behaviour policy and how complaints are dealt with, and well as a diversity plan), not because it’s ‘PC, but because it results in stronger products and more sustainable businesses. Think of it this way: everyone else is optimising in other direction and there’s still no clear best in breed. So, this is how you can differentiate and stand out. Need a hand finding that building block? Book a 60 minute call with me. If you want to maximise the number of lynxes, you need to optimise for bunnies. Why Wyld isn’t an Agency. Earlier this year, an independent contractor and I jointly pitched a prospective client. We were up against an agency, who tend to have the kinds of expense accounts to better woo clients. Truth be told, we may not have cost much less than the agency. I’ve been told by an independent developer that an agency won a pitch that equalled his solo asking price. I can see how it probably seemed like getting more hands on deck is better value for money. The thing is, I’ve worked for agencies. People who know me in real life have heard me describe my experiences in creative agencies as being like that of a digital sweatshop. The end clients never saw this aspect. They saw a quickly produced website and didn’t think to question what was under the hood or how many people inherited the project from someone who quit suddenly from stress or interned out, or that they were utterly miserable for not being able to take the steps necessary to do quality work, and constantly in a state of anxiety of needing to work faster. This isn’t a model I have any intention of replicating. The price we pitch is the cost of two experienced people who will do a standard of work that’s equally suited to be maintained by us or handed over to someone else without hours lost to finding where the spaghetti code is hidden. A standard we can stand by and be proud of. It’s for our advice on what’s best for the client’s aims and overall business, even if it’s not what they had in mind. If I ask a personal instructor or dietician to give me a plan to become unhealthily skinny, I would hope they wouldn’t carry out my wishes by saying “well, it’s what they wanted”. We have to be more than a monkey’s paw, granting wishes and abdicating responsibility for the outcome. Some agencies hire as if three juniors coding is the same in terms of quality and speed as having one experienced developer. In practice, the reverse is true. More juniors can never work as a fast as a senior because all of them need to get approval at each stage from someone. And that someone will max out on smart feedback as the day gets longer. But when you’ve committed to the idea that team size matters and there’s an office that needs paying for, you’ll hire for affordability. And you can’t take too long on any job because that expanded payroll needs to pay for itself quickly. Do clients ever win with all that pressure, tension and cost-cutting behind the scenes? Small is less stressful and allows more creativity and problem solving without the big overhead. 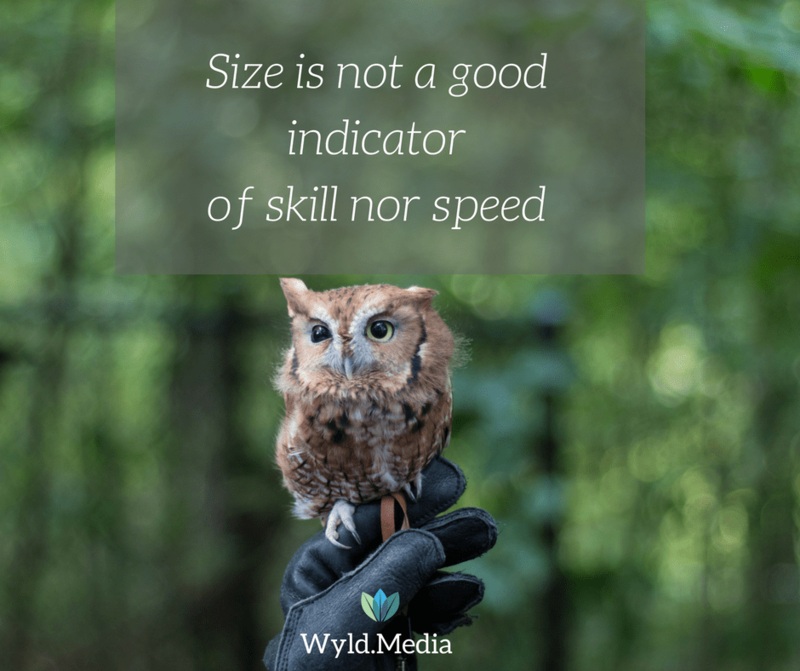 Small is nimble and arrives at decisions quickly. Small means seeing clients as people, not as “briefs” to “fulfil”. Small means no one has to wonder what was said in a meeting, leading to mistrust or misunderstandings later on. This will eventually affect work. Small means no one gets shoved in the back of group photos for not being cute enough or important enough and pretend to be ok with that. This also will eventually affect work. Small means there’s no job that can ever be more important than my relationship with a work partner, or their happiness or health. Sharing is caring: Youtube playlists for focus and chill time. Today is winter solstice. Traditionally, this day marked the begging of Yule: a period celebrated with burning fires and getting as fat on good food and drink. In other words, the most “I’m down with that” festivity in the northern hemisphere. Since most offices kind of frown upon burning fires and I do not live in a fancy enough apartment to have a fireplace, I put together a 4k video playlist of log fires for people with two monitors to enjoy and feel cosy while at work, or for putting on the smart tv while reading that ebook later. There’s 4k fireplace, a campfire on a mountain view, a fire near a running river with water and forest noises. I’ve also got a 4k video playlist of nature-based scenes (aurora borealis, jellyfish tank, sun shining through autumn leaves) and ambient chill music, good for getting in the flow, getting out of a bad mood, blocking out distractions, or putting the day behind you.